A Renowned ALS Researcher Dies from the Disease. Now His Son Is Looking for Its Biomarkers. Nicholas T. Olney, PhD, the recipient of a research award in amyotrophic lateral sclerosis (ALS), is researching neurofilament-light and a cervical spine imaging method called phase sensitive inversion recovery as ALS biomarkers. He was inspired by his father, Richard K. Olney, MD, a renowned ALS researcher who developed the disease and died in 2012. BOSTON—Neurologists may recall the story of Richard K. Olney, MD, who studied amyotrophic lateral sclerosis (ALS) for over 30 years before developing the disease himself and dying in 2012. Fewer may know how that tragic turn of events changed the life of his son. When his father was diagnosed in 2004, Nicholas Olney was two years out of college at the University of California, San Diego, where he had double-majored in biochemistry and theatre. Working at a biotechnology firm, he figured he would eventually get a PhD. And then, within two months of his father receiving the diagnosis of ALS, Nicholas Olney dropped everything and became his father's full-time caregiver, eventually applying to and attending medical school at the University of California, San Francisco (UCSF). Upon completing his residency after the death of his father, his research interest turned, perhaps inevitably, to ALS. In April, at the AAN Annual Meeting here, Dr. Olney received the Clinical Research Training Fellowship in ALS Research, cosponsored by the AAN and the ALS Association. His research project seeks to identify biomarkers of the disease, using both neurofilament-light (NF-L) and a novel method of cervical spine imaging called phase sensitive inversion recovery, or PSIR. One of Dr. Olney's first published studies grew directly out of a symptom he saw in his father: pseudobulbar affect, marked by pathological laughing or crying. The younger Dr. Olney took a year off from medical school as a Doris Duke fellow to study the condition, collaborating with the UCSF ALS Center, which his father founded; the UCSF Memory and Aging Center, and the UC Berkeley emotions laboratory. Bruce L. Miller, MD, FAAN, professor of neurology at UCSF and a longtime collaborator of the elder Dr. Olney, supervised the research. Contrary to many clinical descriptions, the episodes of pathological laughing and crying his group observed were usually induced by contextually- appropriate stimuli and associated with strong experiences of emotion. But rather than being associated with general emotional hyperactivity, the study found that the disorder may be due to dysfunction in frontal neural systems that support voluntary regulation of emotion. The results were published in 2011 in the journal Brain. That hadn't always been the plan. In October of 2004, he was happily ensconced at a biotech start-up when he learned that the symptoms of a “bone spur” that had been compressing his father's spine was actually ALS. A lift system was installed to help the elder Dr. Olney get out of bed and move from one room to the next. He used a laser pointer on his glasses to communicate, which even allowed him to help his son as he studied, first for the MCATs and then in medical school at UCSF. The two sometimes discussed whether it was purely due to chance that a world-class ALS expert came down with the very rare disease himself. As for the future, Dr. Olney hopes to continue his ALS research in developing biomarkers for early and correct disease detection, which should lead to cures and treatments. •. Olney NT, Goodkind MD, Lomen-Hoerth C, et al Behavior, physiology and experience of pathological laughing and crying in amyotrophic lateral sclerosis https://academic.oup.com/brain/article-lookup/doi/10.1093/brain/awr297. Brain 2011; 134 (Pt 12): 3458–3469. In the Clinic: ALS: A Renowned ALS Researcher Dies from the Disease. Now His Son Is Looking for Its Biomarkers. 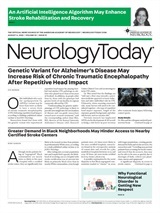 Neurology Today17(15):14-15, August 3, 2017.